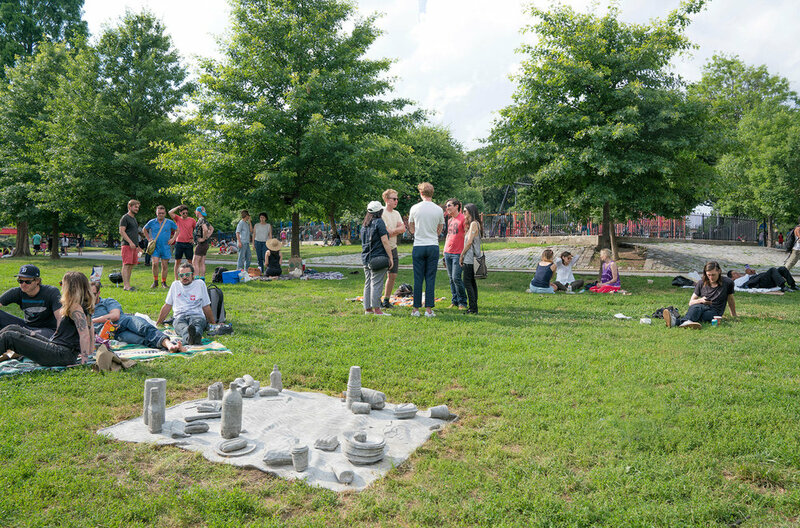 Made specifically for Maria Hernandez Park and the surrounding Bushwick community, this familiar picnic scene symbolizes the gathering, relaxing and sharing experienced with friends and family in public space. 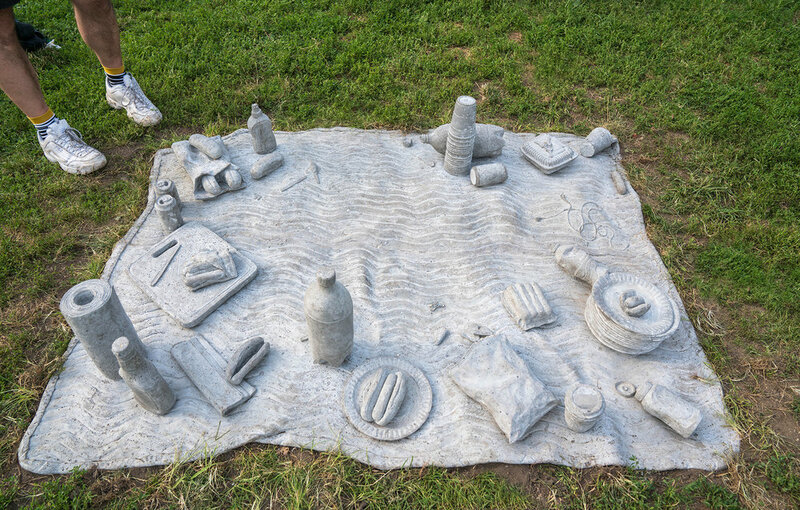 This hand-cast concrete picnic serves as a tribute to those symbols, turning a temporary happening into a static monument for participation and contemplation. Picnic is sponsored by NYC Parks and Recreation Dept. and, in part, by the Greater New York Arts Development Fund of the New York City Department of Cultural Affairs, administered by Brooklyn Arts Council (BAC). An Interior Complex recreates the stone balustrade bordering the edge of Wave Hill’s Lower Lawn inside their window patio Sun Porch. Beginning on the exterior stone precipice of the sun porch, 25 surreal hand-made balusters appear to be crashing through the window and entering the room. As the balusters edge further into the space, they become anthropomorphized, breaking apart, losing their function and mimicking deflated and mutated beings. 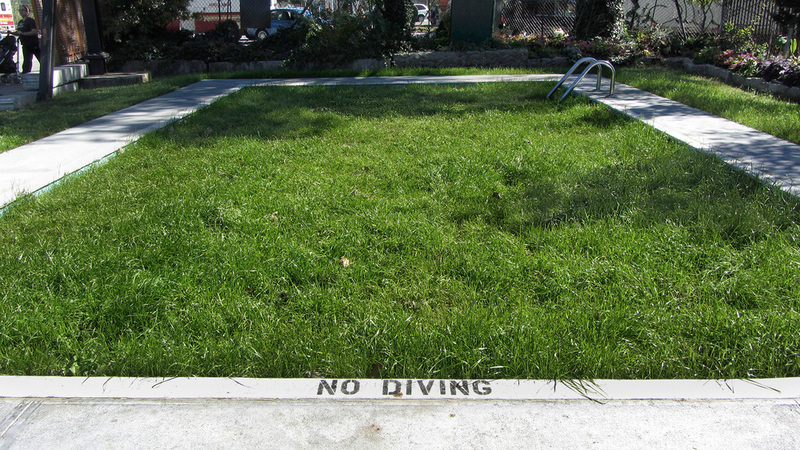 This commissioned sculpture is a second iteration of A Public Pool presented at Socrates Sculpture Park. Positioned specifically for The Lot, a small park on Crescent Street, this Backyard Pool serves as a flagship of non-functionality and dislocation in the bustling urbanity of Long Island City. Public Art Review: Forecast Public Art, "Tamara Johnson’s Waterless Pools"
This pool is part of Socrates Sculpture Park’s EAF 13: Emerging Artist Fellowship Exhibition. Based on public pools built around Brooklyn, NY in the late 1930's by the NY Parks Commission, this iteration of a public pool appears to be forgotten and filled with earth, summoning uncanny memories of play, loss and the effects of abandonment on a landscape. Hand-painted bunting, initially installed in an abandoned power plant in Burlington, Vermont, stand as symbols of shifting commerce and uprooted emblems of opportunity. Painted, bleached and stained to appear aged and tattered, these flags recall a time past, holding on to the promise of new beginnings. This installation features a landscape of rubber hoses in disarray amongst a small private environment in the bathroom space at Rooster Gallery in NY’s lower eastside. The water hose, a common everyday object encountered often outdoors, becomes a growing vine, an exposed intestine, a sinewy drawing reaching across the floor of the gallery bathroom. A temporary sculpture installed at the private Point Pleasant Beach in New Jersey. A previously owned pool ladder purchased from a man cleaning his backyard after Hurricane Sandy was installed in the sand. This intervention supposes the entire beach is covering something buried below. An exercise in site-specific public intervention conducted post snowstorm in Brooklyn, NY. Printed sheets of St. Augustine grass, a grass native to gulf regions of the U.S, were cut to size to fit inside footprints as if to reveal a lush landscape below the frozen Bushwick neighborhood. 32" x 13" x 40"
A performance conducted in downtown Providence, RI in which the body merges with a faux slumping barricade. The body and object function together in flux, both as support structures and crushing forces. 12' x 6" x 6"
Documentation of public performance conducted in downtown Providence, RI in which a faux steel beam attached to an existing steel scaffolding and proceeded to be “held up” for the duration of a day.